Happy All Souls Day! This is the day where we remember all the souls that have passed on from this life to the next. We pray for all these souls on this final journey to God, with the hopes that they might be united with God eternally. When I was struggling with Christianity, I had trouble believing in several huge issues, such as whether God actually exists, or if Jesus can even be God. But one thing I never had trouble with believing was this idea that, if God exists, then it’s necessary that you pray for the dead. Also, if God exists, then Purgatory seemed perfectly logical. In fact, the idea that Purgatory might not exist seemed logically inconsistent if you believed in God’s Divinity in the first place. My reasoning? If God is real, humans have eternal souls, and God demands that everybody be pure and clean before they enter into His Divine Presence — which is an idea that is repeatedly stated both in the Old and New Testaments — then it stands to reason that very few are going to end up being pure enough to get into the Kingdom of God. But! Jesus says He will be our advocate, which makes it more likely that we can enter into Heaven, so as long as we follow Him, since He will wash away our sins by His Blood. Yay! But, if we die with sin while still following Christ faithfully, that means He’ll have to wash away our sins with His Blood… after the fact. And I don’t know about you but, as a mother of two young toddlers, being washed is not necessarily a fun experience! Still, that idea of cleansing, in a nutshell, is what the idea of Purgatory is! It’s a temporary state where you are being cleansed so that you can enter into the Kingdom of Heaven properly! Mind you, it’s only a temporary state. There are only two final destinations that we Christians believe in — Heaven and Hell. But, that does not take away from the reality of purgatory! One of the most common artistic depictions of purgatory is being surrounded by fire. The fire symbolizes God’s love, which purifies everything, while those in the fire wait for the heavenly host (usually angels, sometimes saints, and sometimes even Jesus!) to rescue them from the fire so that they may join Heaven. Here’s one manuscript illumination in the French Gothic style from the Les Très Riches Heures du duc de Berry. 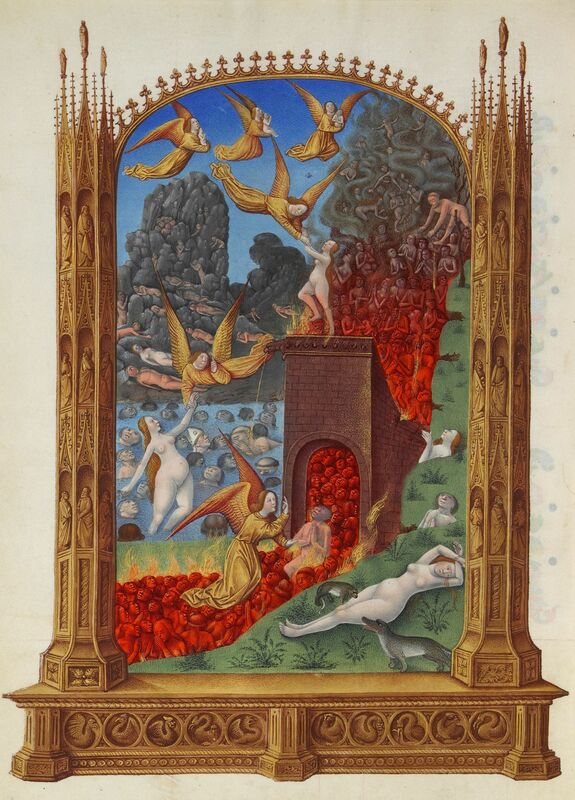 Purgatory from Les Très Riches Heures du duc de Berry, c. 15th century. Musee de Conde, Chantilly, France. Mind you! This is not hell fire for the damned, which there is no respite from and is used for the sole purpose of destruction. On the contrary! While it is used to destroy sin, it is also used to cleanse and to renew. I have to admit, even though the idea of fire is kind of petrifying, it is wonderfully poetic since it connects the Old Testament with the New Testament in a lovely way. For example, look at this passage of Isaiah! Of course some like to argue whether it is actually fire or not, and there have been some pretty heated arguments about that. Honestly, I have no idea! But whatever God has in store for me, I’ll trust in Him. He knows the details — I’ll just follow Him! So, pray for those that you love, as well as the poor souls in Purgatory! I personally recommend the Litany for the Poor Souls in Purgatory… it seems to cover all the bases! Embrace the souls that have gone before us in Your loving embrace and grant them eternal peace with You. ← Happy All Saints Day!